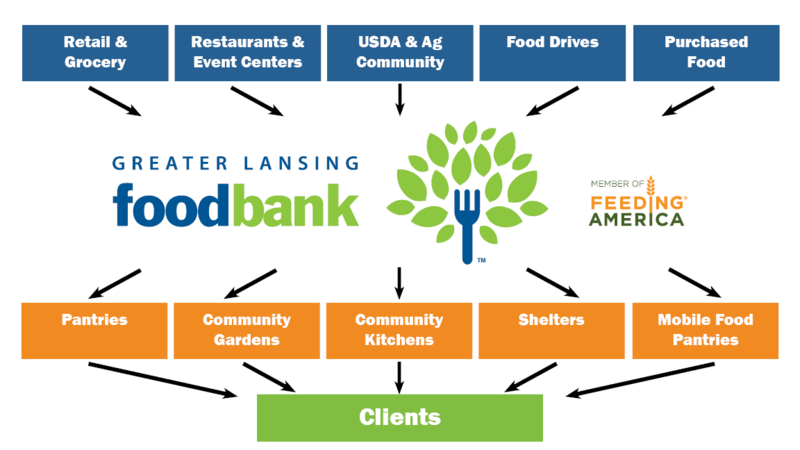 What do we do at the Greater Lansing Food Bank? We feed people. We make certain that everyone in our community has access to nutritious food, because we can all agree, that no one should ever go hungry in our community. Where does GLFB get food? The food bank gets food from retailers, the USDA, food producers, purchased goods and from food drive donations. Everyone at risk, because hunger does not discriminate. We provide emergency food to families and children and retirees and veterans who have served our country. We serve people who look just like you and me. We help people to perform better at work and school and at home, because food is a basic need. Remember, that no one ever plans to be hungry. We can only meet this need because of the continuing support of the caring people and businesses in our community. What type of food does GLFB distribute? Greater Lansing Food Bank provides food from all of the food groups, including: meat & proteins; fresh produce; dairy; and bread, pasta & grains. How does food move through the GLFB network? Greater Lansing Food Bank could not meet the need of the communities we serve without the help of volunteers and donors. You can get involved by: holding a food drive; donating canned and boxed goods; supporting GLFB financially; and by letting everyone know that there is help available.